Click on image for closeup detail. This is an ORIGINAL watercolor painting by internationally known water color artist Hae Ja Brosseau. Painting size without mat 10" x 14" (Ideal frame size: 14" x 18" or 16" x 20"). By eliminating all overhead and selling this painting over the internet, UNMATTED and UNFRAMED, Hae Ja is able to offer you this beautiful painting at a tremendous savings over what you would expect to pay in an art gallery. This is a NO RESERVE auction. Please check our feedback. We guarantee 100% complete customer satisfaction! Hae Ja Brosseau was born in Yosu, South Korea. As a young girl she was always interested in art, and after high school studied western painting and portraiture at Surabul Art College in Seoul. In the years that intervened Hae Ja came to the United States and was mainly involved in raising a family keeping her hand in the occasional portrait. In 1989, Hae Ja and her husband moved to Invercargill, New Zealand. There Hae Ja studied under noted Southland artists Lyn Johnston and Pat Hall. She is winner of the 1991 Fay Good Scholarship awarded by the New Zealand Porcelain Artists Association. While in New Zealand, Hae Ja was an "artist member" of the Southland Art Society, and has exhibited her works at the Southland Museum in Invercargill, the Queens Gallery in Queenstown, N.Z., and McKillop's Art Gallery in Invercargill. She and her husband lived for a time in Halifax, Nova Scotia, where Hae Ja's paintings were available through the Art Sales and Rental Society associated with the Art Gallery of Nova Scotia. Hae Ja now paints from her home in Citrus Springs, FL, while assisting her husband who is the pastoring a church there. We ship immediately upon receipt of Visa and MasterCard orders through PAY PAL or upon receipt of Money Orders/Cashier's checks. Personal checks are accepted only from U.S. and must clear before the item is shipped. major credit card via BidPay. Fast, easy & secure. FASTER & SECURELY with BidPay. U.S. buyers pay postage and handling fee of US$7.50. Canadian buyers pay US$10.00. Overseas buyers pay actual shipping costs, plus US$2.50 handling fee. Item will be sent by USPS. Satisfaction guaranteed (U.S. and Canadian buyers only). Paintings may be returned to us within 10 days of receipt for a full refund, LESS the original postage and handling fee of US$7.50 for U.S. buyers (US$10.00 for Canadian buyers). 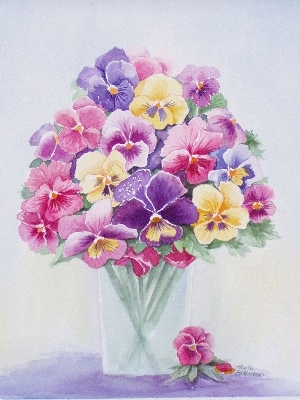 FOR MORE GREAT ORIGINAL WATERCOLOR PAINTINGS VISIT HAE JA'S GALLERY!